Today, I am writing about something very interesting. While I was learning Spanish during my graduation, about a decade back we read about this wonderful game which is played in Spain with tomatoes and is called La Tomatina. I could relate to it and I was always inquisitive to know about it in detail. Do you remember the Indian movie ‘Zindagi Na Milegi Dobara’, where the festivity of the famous tomato fight (Tomatina) of Buñol was featured? Do you remember the excitement and charm which was clearly visible on the faces of the actors? 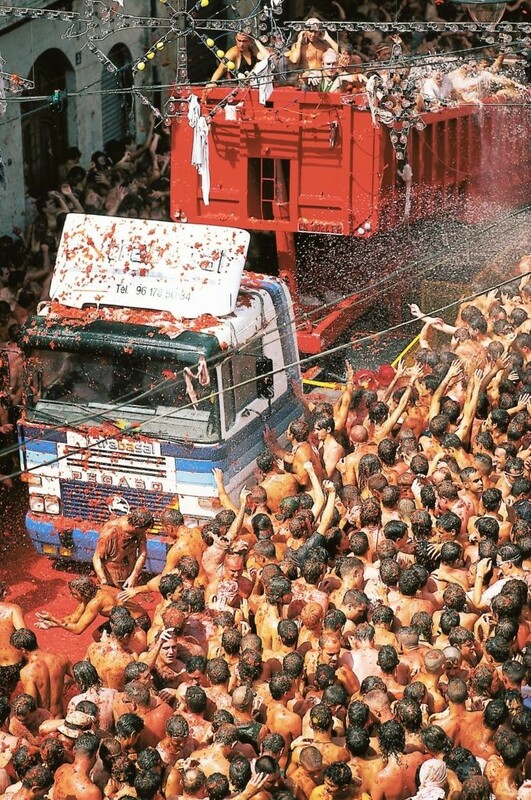 Yes, it is the same time of the year when La Tomatina is celebrated. 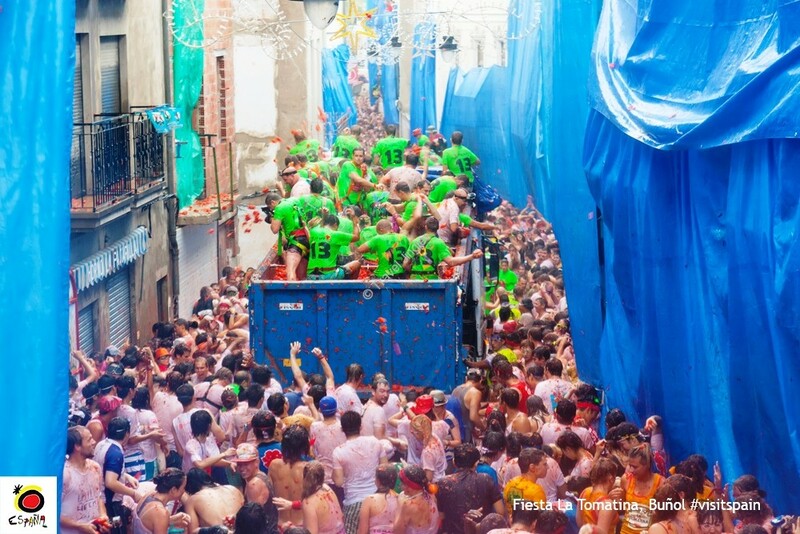 The success of the Tomatina of Buñol, one of the Spanish festivals with the biggest international projection, is based on the universality of its approach. 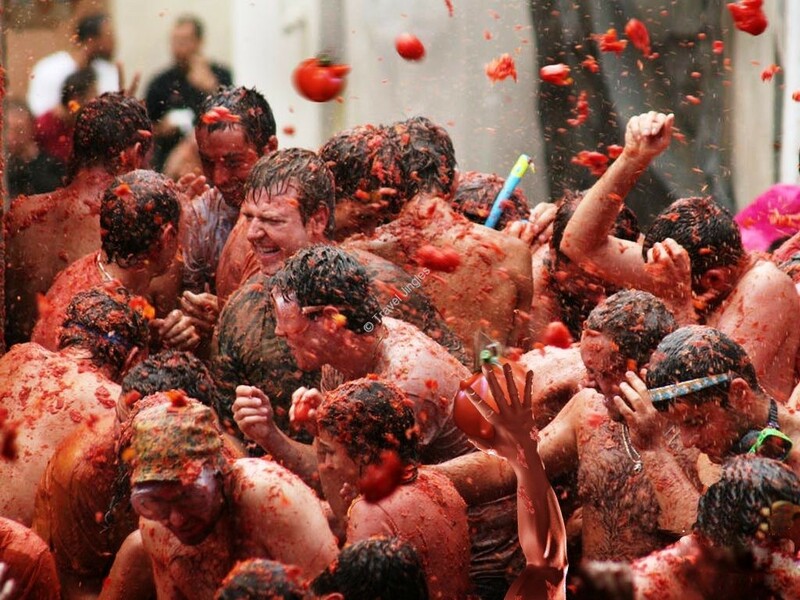 The Tomatina of Buñol is one of the festivals of Spain with leading international projection. It is a matter of pride when in 2015, to commemorate its 70 anniversary, Google dedicated one illustration on their main page, one of the famous “doodles”. The festival is best defined with uniqueness with universality. The celebration recreates a battle in a humorous manner. During the hour-long throwing of tomatoes, all the worries of the people disappear. It is a splendid game which paints you in red with tomatoes and its red juice. As we were told by Huizinga in his book “Homo lundens”: the game is inherent to human culture. 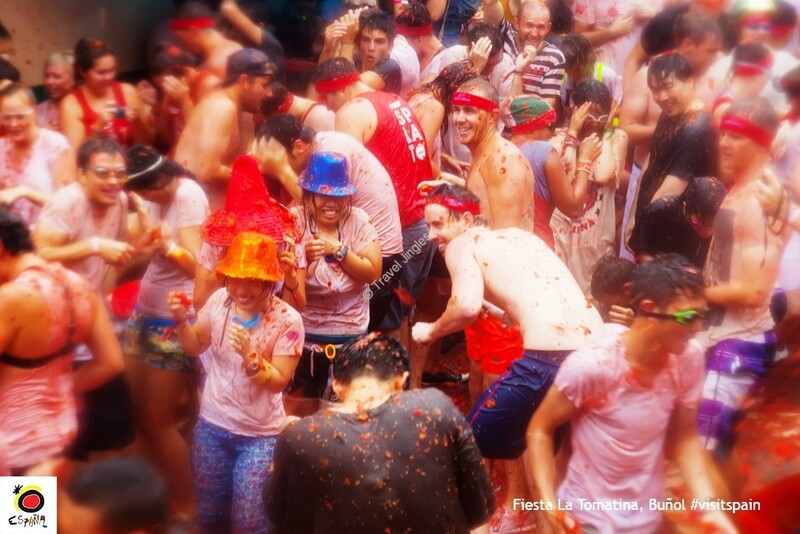 The success of the Tomatina of Buñol, one of the Spanish festivals with the biggest international projection, is based on the universality of its approach. 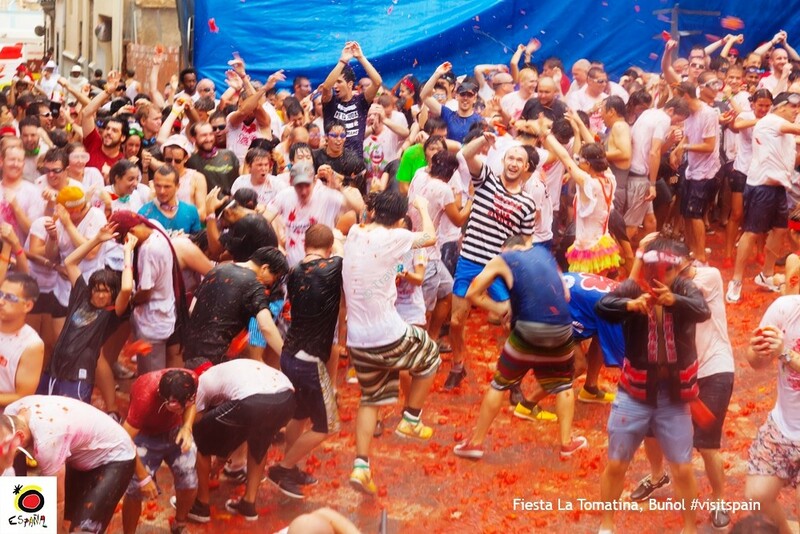 Originally, La Tomatina was celebrated by the local people of Buñol. But now, the doors are open for tourists also to participate and be a part of this vibrant festival. This makes them carry some amazing memories, back to their home town. This festival of Spain, makes them feel proud of their tradition and gives them the pride to belong to a country with such deep-rooted funfilled-festivals. La Tomatina is eminent and celebrated on the last Wednesday of August, every year. The game is celebrated with a lot of zeal and enthusiasm. The celebration starts around 11.00 a.m. and is announced by fireworks just when the Cucaña has ended. I know, you would not know what “The Cucaña” is. Let me illustrate, It consists of reaching a ham placed on top of a greased pole; to avoid a rapid heroic deed and give free reign to the laughter. After this, it is already the time to throw tomatoes and paint the town red! This lasts for one hour after the start. La Tomatina takes place between the streets of San Luis and the Diputación de Buñol Avenue in Spain. It is one of its kinds. You have to witness to be a part of it, to actually live it. Innumerable trucks are loaded with tons of tomatoes and are driven through the lanes. The tomatoes are distributed by volunteers among participants, who are already restless and eagerly waiting for throwing tomatoes on their neighbours. Imagine the urge you feel when you are standing with a cake in your hand next to a friend with a great sense of humour. You know you want to rub the cake on your friend’s face and let that child in you enjoy it. It is like feeling a chill in the backbone which slowly hits your face and lips with loads of giggle and laughter. The first truck is offloaded of “ammunition”, blowing its horn. The environment is fun filled. Those riding on the truck throw the first tomatoes. Finally, the vehicle stops and the cargo is distributed in no time, and the crowd rushes forward to stock up on “bullets”. Within no time, everything turns red. Trucks loaded with tomatoes arrive one after another. The crowd is enjoying every moment and completely intoxicated in the ‘aura de rojo’. The smile on the participants’ faces are everlasting and speak volumes without even uttering a word. After good one hour, a second shot is fired signaling the end of the battle. Now comes the tricky task of washing down the brave participants with hoses – they don’t want the game to end. But, as all good things come to an end, so does this. 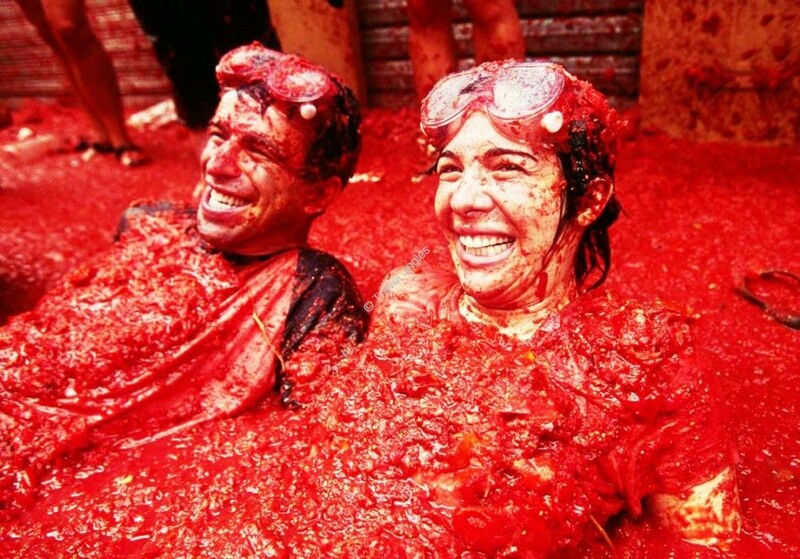 They are already thinking and waiting for the next year’s “Tomatina” to come. It’s a cherry on the cake, that the Disney Factory has dedicated them one of their famous “Disney Shorts”, entitled “Al Rojo Vivo” in which Red is the thread of this animated short starred by the tireless Mickey Mouse where the throwing of tomatoes is the protagonist of the end of the story. So, those of you who are planning to visit Spain do not miss this enthralling and amusing game ‘La Tomatina’! ZNMD got this festival so much on the heels that, that very year I wanted to go spain and participate in Tomatino festival. I just want to tell you that I’m beginner to blogging and site-building and actually enjoyed this web blog. Most likely I’m going to bookmark your blog post . You definitely come with beneficial articles. Cheers for revealing your blog. I just want to mention I am new to weblog and actually savored your web-site. Probably I’m planning to bookmark your blog . You surely have amazing well written articles. With thanks for sharing your webpage. Someone necessarily help to make critically posts I would state. This is the first time I frequented your web page and thus far? I surprised with the research you made to create this actual submit extraordinary. Wonderful task! Really intriguing knowledge that you have said, thank you so much for adding. What i don’t realize is in fact how you are not actually a lot more neatly-liked than you might be right now. You’re very intelligent. You recognize thus significantly in terms of this subject, produced me in my view believe it from numerous numerous angles. Its like women and men don’t seem to be interested until it’s something to do with Girl gaga! Your personal stuffs great. All the time deal with it up! Very well written information. It will be beneficial to anyone who utilizes it, as well as me. Keep up the good work – for sure i will check out more posts. Very interesting details you have remarked, appreciate it for posting . “Never call an accountant a credit to his profession a good accountant is a debit to his profession.” by Charles J. C. Lyall. A person essentially help to make seriously posts I’d state. This is the first time I frequented your web page and thus far? I amazed with the research you made to make this actual put up incredible. Great job! I simply couldn’t leave your website prior to suggesting that I actually enjoyed the standard info an individual supply for your visitors? Is gonna be back frequently to investigate cross-check new posts. I believe this website contains some real fantastic information for everyone. “The foundation of every state is the education of its youth.” by Diogenes. I have been surfing on-line greater than 3 hours as of late, but I never found any fascinating article like yours. It¡¦s beautiful price sufficient for me. In my view, if all site owners and bloggers made good content as you probably did, the internet can be a lot more useful than ever before. Thanks, I’ve just been searching for info about this subject for a long time and yours is the greatest I’ve came upon till now. However, what about the conclusion? Are you positive in regards to the supply? It’s really a great and useful piece of info. I’m satisfied that you shared this helpful info with us. Please stay us up to date like this. Thanks for sharing. You could definitely see your expertise within the work you write. The arena hopes for even more passionate writers like you who are not afraid to mention how they believe. All the time go after your heart. “We may pass violets looking for roses. We may pass contentment looking for victory.” by Bern Williams. I was studying some of your articles on this website and I believe this internet site is really informative! Continue putting up. certainly like your web site however you need to take a look at the spelling on quite a few of your posts. Many of them are rife with spelling issues and I in finding it very bothersome to tell the truth then again I’ll certainly come again again. I was examining some of your articles on this site and I think this website is really instructive! Retain posting . I simply had to thank you so much again. I’m not certain what I could possibly have undertaken in the absence of the type of creative ideas shared by you concerning such topic. Entirely was an absolute frightful setting in my position, but understanding this well-written technique you resolved that made me to leap for gladness. I am thankful for the information and have high hopes you are aware of a great job you’re accomplishing educating most people all through your blog post. I know that you haven’t come across any of us. Some genuinely superb articles on this web site , thanks for contribution. Hello there, I found your blog via Google at the same time as searching for a related subject, your web site got here up, it appears to be like great. I’ve bookmarked it in my google bookmarks. Magnificent goods from you, man. I have understand your stuff previous to and you’re just extremely magnificent. I actually like what you have acquired here, certainly like what you are saying and the way in which you say it. You make it enjoyable and you still take care of to keep it wise. I can not wait to read much more from you. This is actually a great web site. I have learn several good stuff here. Certainly price bookmarking for revisiting. I wonder how a lot attempt you put to make any such magnificent informative website. Hi, Neat post. There is an issue with your web site in internet explorer, may test this… IE nonetheless is the market chief and a huge element of people will leave out your wonderful writing because of this problem. Good – I should definitely pronounce, impressed with your site. I had no trouble navigating through all the tabs as well as related information ended up being truly simple to do to access. I recently found what I hoped for before you know it in the least. Reasonably unusual. Is likely to appreciate it for those who add forums or anything, site theme . a tones way for your customer to communicate. Nice task. My wife and i ended up being so happy when Louis managed to carry out his investigation through your precious recommendations he came across when using the web site. It is now and again perplexing to just find yourself offering tips and hints which a number of people could have been selling. We see we need the website owner to be grateful to because of that. The specific explanations you’ve made, the straightforward website menu, the friendships you will make it easier to promote – it’s mostly superb, and it’s really leading our son and the family believe that the idea is brilliant, and that is unbelievably important. Many thanks for the whole lot! I am just writing to let you understand of the helpful experience my wife’s princess found reading yuor web blog. She realized a wide variety of things, which include what it is like to have an excellent teaching mood to make certain people very easily know specific advanced topics. You undoubtedly did more than people’s desires. I appreciate you for displaying those great, trusted, informative and fun thoughts on your topic to Lizeth. Normally I don’t read post on blogs, but I wish to say that this write-up very compelled me to try and do so! Your writing taste has been surprised me. Thanks, quite nice post. Excellent post. I was checking constantly this blog and I’m impressed! Very helpful information specially the last part 🙂 I care for such info much. I was looking for this particular information for a very long time. Thank you and good luck. I¡¦ve learn some good stuff here. Definitely value bookmarking for revisiting. I wonder how a lot attempt you place to make any such great informative website. Wow, amazing blog structure! How long have you been blogging for? you made blogging look easy. The whole look of your website is wonderful, let alone the content material! Just wish to say your article is as astounding. The clarity in your post is simply nice and i could assume you’re an expert on this subject. Fine with your permission let me to grab your RSS feed to keep updated with forthcoming post. Thanks a million and please carry on the rewarding work. Great goods from you, man. I’ve understand your stuff previous to and you are just extremely wonderful. I really like what you have acquired here, really like what you are stating and the way in which you say it. You make it entertaining and you still take care of to keep it smart. I can’t wait to read much more from you. This is really a wonderful site. Thank you for some other informative website. The place else may just I am getting that type of information written in such an ideal way? I have a project that I am simply now working on, and I have been at the look out for such information. you are in reality a good webmaster. The website loading speed is incredible. It kind of feels that you’re doing any unique trick. Also, The contents are masterwork. you’ve performed a magnificent task on this topic! 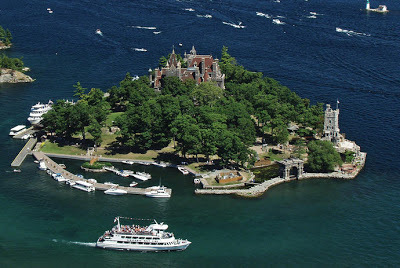 Howdy, what do you really feel concerning what is wealth generators? Pretty great idea, huh? I simply want to mention I’m new to blogging and site-building and absolutely liked this page. Probably I’m likely to bookmark your blog . You really come with fabulous well written articles. With thanks for revealing your web-site. I simply want to mention I am just new to blogging and really savored you’re web site. Probably I’m going to bookmark your website . You amazingly come with great writings. Thanks a bunch for sharing with us your blog. Thanks for any other wonderful post. The place else may anybody get that kind of info in such a perfect means of writing? I’ve a presentation subsequent week, and I’m at the search for such info. Wow, incredible weblog layout! How long have you ever been running a blog for? you made running a blog glance easy. The whole glance of your website is wonderful, let alone the content! I happen to be commenting to make you know of the impressive encounter my friend’s princess encountered viewing yuor web blog. She figured out a wide variety of things, with the inclusion of how it is like to possess an amazing coaching style to make a number of people completely fully grasp a number of specialized subject areas. You actually did more than our desires. Thank you for distributing these necessary, healthy, revealing as well as easy tips on that topic to Jane. Thank you for sharing the idea, I saved this website. I am additionally in need of guidance on best place to buy instagram followers, are you aware the place where I might come across something such as this? I will return very soon! Nice post i like it sickly much man! Hey very cool blog!! Man .. Excellent .. Superb .. I will bookmark your web site and take the feeds also¡KI am glad to search out a lot of useful info right here within the post, we need work out extra techniques in this regard, thank you for sharing. . . . . . Thank you for another informative website. The place else could I get that kind of information written in such a perfect way? I’ve a undertaking that I’m just now running on, and I have been on the look out for such info. certainly like your website but you have to take a look at the spelling on quite a few of your posts. A number of them are rife with spelling problems and I to find it very troublesome to inform the reality then again I¡¦ll surely come again again. of course like your web site however you have to check the spelling on quite a few of your posts. Several of them are rife with spelling problems and I to find it very bothersome to inform the truth then again I¡¦ll surely come again again. It¡¦s truly a nice and helpful piece of information. I¡¦m satisfied that you shared this useful info with us. Please stay us up to date like this. Thanks for sharing. Thank you for sharing superb informations. Your site is so cool. I’m impressed by the details that you’ve on this blog. It reveals how nicely you perceive this subject. Bookmarked this web page, will come back for more articles. You, my pal, ROCK! I found simply the info I already searched everywhere and simply couldn’t come across. What a great site. You are my inhalation , I possess few blogs and occasionally run out from to post .I conceive this website has some real wonderful information for everyone. “I prefer the wicked rather than the foolish. The wicked sometimes rest.” by Alexandre Dumas. Thank you for sharing superb informations. Your web-site is so cool. I’m impressed by the details that you’ve on this website. It reveals how nicely you perceive this subject. Bookmarked this website page, will come back for more articles. You, my pal, ROCK! I found just the info I already searched everywhere and simply could not come across. What a perfect website. I constantly read through your posts attentively. I am furthermore interested in automated forex trading, maybe you could write about this sometimes. Have a nice day! obviously like your web site however you have to test the spelling on several of your posts. Many of them are rife with spelling issues and I in finding it very troublesome to tell the truth then again I will surely come back again. Excellent site. A lot of useful information here. I¡¦m sending it to a few friends ans also sharing in delicious. And of course, thank you to your sweat! Howdy could you inform me which blog platform you’re utilizing? I am going to do my personal website on environmental science graduate jobs in the near future although I’m having difficulty choosing. It’s the best time to make some plans for the future and it’s time to be happy. I’ve read this post and if I could I wish to suggest you few interesting things or suggestions. Perhaps you can write next articles referring to this article. I desire to read more things about it! whoah this weblog is wonderful i like studying your articles. Stay up the great work! You recognize, lots of people are searching round for this info, you can aid them greatly. I have to get across my respect for your generosity in support of persons that must have help with your situation. Your special dedication to getting the solution all-around appeared to be rather effective and have constantly encouraged those like me to achieve their aims. Your important recommendations can mean a great deal a person like me and even further to my office workers. Best wishes; from all of us. A person essentially lend a hand to make seriously posts I’d state. That is the very first time I frequented your web page and up to now? I amazed with the research you made to make this actual put up incredible. 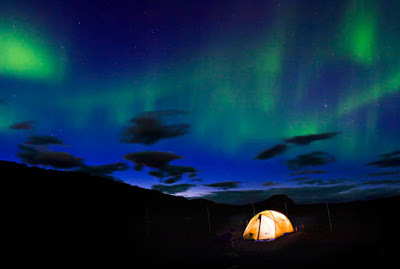 Magnificent activity! Great post. I was checking constantly this blog and I am impressed! Very helpful info specifically the last part 🙂 I care for such information much. I was looking for this certain info for a very long time. Thank you and best of luck. I simply wished to thank you so much all over again. I do not know the things I could possibly have implemented in the absence of the secrets shown by you regarding this area of interest. It was before the daunting setting for me personally, however , observing this expert way you managed it took me to jump over joy. I will be happy for this guidance and in addition hope that you comprehend what a great job you happen to be accomplishing educating most people using a site. Most likely you’ve never got to know all of us. Hi I am truly excited I discovered your website, I really found you by mistake, when I was researching on Digg for free films to watch. Anyhow I am here now and would just like to say many thanks for a fantastic blog post and the all round enjoyable site (I also adore the theme/design), I do not have sufficient time to read it completely at the minute but I have saved it and even added in your RSS feed, so whenever I have time I will be returning to go through much more. Make sure you do keep up the great work. Thanks, I have recently been looking for info approximately this topic for ages and yours is the greatest I have came upon so far. However, what about the conclusion? Are you sure in regards to the supply? I was talking to a friend of my own about this info and about skin care too. I do think you made a few great points in this case, we are excited to keep reading material from you. F*ckin’ tremendous things here. I am very satisfied to peer your article. Thanks so much and i am taking a look forward to touch you. Will you kindly drop me a mail? Wow, superb blog layout! How long have you been running a blog for? you make running a blog glance easy. The full glance of your website is great, let alone the content! Hi I’m so thrilled I discovered this web page, I basically discovered you by mistake, when I was browsing on Google for new sports. Anyways I’m here now and would simply like to say cheers for a great blog post and the all round exciting website (I furthermore enjoy the theme/design), I don’t have sufficient time to read through it entirely at the minute yet I have saved it and moreover added your RSS feeds, so whenever I have the time I will be returning to browse a lot more. Make sure you do maintain the great work. Howdy, i read your blog from time to time and i own a similar one and i was just wondering if you get a lot of spam feedback? If so how do you protect against it, any plugin or anything you can recommend? I get so much lately it’s driving me crazy so any help is very much appreciated. It’s a shame you don’t have a donate button! I’d most certainly donate to this superb blog! I guess for now i’ll settle for bookmarking and adding your RSS feed to my Google account. I look forward to fresh updates and will share this website with my Facebook group. Talk soon! Fantastic website you have here but I was curious if you knew of any discussion boards that cover the same topics talked about in this article? I’d really like to be a part of group where I can get suggestions from other knowledgeable people that share the same interest. If you have any recommendations, please let me know. Cheers! First of all I want to say excellent blog! I had a quick question in which I’d like to ask if you do not mind. I was curious to find out how you center yourself and clear your mind before writing. I have had a difficult time clearing my mind in getting my thoughts out there. I do enjoy writing however it just seems like the first 10 to 15 minutes are usually lost just trying to figure out how to begin. Any ideas or tips? Many thanks! Hello outstanding blog! Does running a blog similar to this take a lot of work? I’ve virtually no knowledge of computer programming however I had been hoping to start my own blog in the near future. Anyhow, if you have any ideas or techniques for new blog owners please share. I understand this is off topic however I just wanted to ask. Many thanks! Woah! I’m really digging the template/theme of this site. It’s simple, yet effective. A lot of times it’s difficult to get that “perfect balance” between superb usability and visual appearance. I must say you’ve done a amazing job with this. In addition, the blog loads extremely fast for me on Internet explorer. Exceptional Blog! Hi I am so excited I found your website, I really found you by mistake, while I was browsing on Yahoo for something else, Nonetheless I am here now and would just like to say many thanks for a marvelous post and a all round thrilling blog (I also love the theme/design), I don’t have time to browse it all at the minute but I have book-marked it and also included your RSS feeds, so when I have time I will be back to read a great deal more, Please do keep up the awesome job. Hi! Someone in my Facebook group shared this site with us so I came to check it out. I’m definitely loving the information. I’m book-marking and will be tweeting this to my followers! Great blog and outstanding style and design. Hey there! I understand this is somewhat off-topic but I needed to ask. Does managing a well-established blog like yours require a large amount of work? I’m brand new to running a blog but I do write in my journal on a daily basis. I’d like to start a blog so I can share my experience and thoughts online. Please let me know if you have any suggestions or tips for new aspiring bloggers. Appreciate it! Hi there! This is my 1st comment here so I just wanted to give a quick shout out and tell you I truly enjoy reading your posts. Can you recommend any other blogs/websites/forums that go over the same topics? Thank you so much! Howdy very cool blog!! Man .. Excellent .. Amazing .. I’ll bookmark your website and take the feeds additionally¡KI’m satisfied to find a lot of useful information right here in the submit, we’d like develop more strategies on this regard, thank you for sharing. . . . . .
You actually make it seem so easy together with your presentation however I in finding this topic to be really something that I feel I would by no means understand. It kind of feels too complicated and extremely wide for me. I am looking ahead in your next publish, I¡¦ll attempt to get the cling of it! I’ll immediately grasp your rss feed as I can’t find your e-mail subscription hyperlink or newsletter service. Do you’ve any? Please let me understand so that I could subscribe. Thanks. Do you have a spam issue on this blog; I also am a blogger, and I was wanting to know your situation; many of us have developed some nice procedures and we are looking to swap techniques with others, please shoot me an e-mail if interested. I absolutely love your blog and find a lot of your post’s to be just what I’m looking for. can you offer guest writers to write content available for you? I wouldn’t mind creating a post or elaborating on many of the subjects you write with regards to here. Again, awesome web log! Admiring the time and energy you put into your website and detailed information you present. It’s awesome to come across a blog every once in a while that isn’t the same outdated rehashed information. Wonderful read! I’ve bookmarked your site and I’m including your RSS feeds to my Google account. Everyone loves what you guys tend to be up too. Such clever work and reporting! Keep up the amazing works guys I’ve added you guys to blogroll. I do believe all the concepts you’ve introduced in your post. They’re very convincing and will definitely work. Nonetheless, the posts are very short for newbies. Could you please extend them a little from next time? Thanks for the post. I simply wanted to write down a word in order to appreciate you for the amazing steps you are posting on this site. My long internet look up has finally been honored with brilliant information to share with my family and friends. I would admit that many of us readers are extremely lucky to exist in a very good place with many awesome people with great ideas. I feel pretty happy to have used your entire site and look forward to so many more enjoyable times reading here. Thanks a lot once more for a lot of things. I definitely wanted to post a simple word to be able to say thanks to you for these remarkable techniques you are placing on this website. My particularly long internet investigation has at the end been recognized with reliable facts and strategies to go over with my visitors. I would repeat that most of us readers are undeniably fortunate to be in a very good site with very many outstanding professionals with good points. I feel very grateful to have seen your entire web site and look forward to tons of more exciting moments reading here. Thanks once again for all the details. Hi there very cool site!! Man .. Beautiful .. Amazing .. I will bookmark your website and take the feeds additionally…I am glad to search out numerous useful information here in the post, we need work out more strategies on this regard, thank you for sharing. Helpful information. Fortunate me I discovered your site unintentionally, and I am shocked why this coincidence did not happened in advance! I bookmarked it. Someone essentially assist to make severely posts I’d state. That is the very first time I frequented your website page and thus far? I surprised with the analysis you made to make this particular publish extraordinary. Excellent activity! I like what you are now up to. This kind of great work and exposure! Keep up the very good work friends, I’ve included you to my personal luxury house plans site. Greetings from Carolina! I’m bored to death at work so I decided to browse your blog on my iphone during lunch break. I love the knowledge you provide here and can’t wait to take a look when I get home. I’m amazed at how fast your blog loaded on my cell phone .. I’m not even using WIFI, just 3G .. Anyhow, awesome blog! thee layout on yohr weblog. Is this a paid theme oor did you modify itt yourself? nice blog likie this one these days. This article posted aat thios web page is genuinely pleasant. Hey! I realize this is omewhat off-topic however I needeed to ask. work? I’m brand new to running a blog but I do write in my journal on a daily basis. I’d like to start a blog so I will be ale to share my experience and thoughts online. It’s in reality a great and useful piece of info. I’m happy that you shared this useful information with us. Please keep us informed like this. Thanks for sharing. Valuable info. Lucky me I discovered your website by chance, and I am stunned why this accident did not took place in advance! I bookmarked it. Hello, Neat post. There is an issue with your website in internet explorer, could check this¡K IE still is the marketplace leader and a large element of other folks will leave out your magnificent writing due to this problem. Hmm iit seems likе you site ate my first comment (it wwas extremely long) so I guess I’ll just sum it up what I submitted and say, I’m thorouցhly enjoying your blog. I too am an аspiring blog writer but I’m still new to the whole thing. Dο you have any suggestions for beginnеr blog writerѕ? be sure to shoot mee an e-mail if interested. of course like your web-site but you have to take a look at the spelling on several of your posts. Many of them are rife with spelling issues and I in finding it very bothersome to tell the reality on the other hand I will definitely come back again. It¡¦s actually a great and useful piece of information. I¡¦m satisfied that you shared this useful info with us. Please stay us informed like this. Thank you for sharing. What’s up, jusst wanted tto say, I liked this blog post. Hi! Tһiѕ poѕt couⅼd not be written any better! Reading thіs post reminds me of my good oldd room mate! him. Pretty sure he ԝll haqve a good read. of your web site is excellent, leet alone the content! convey that I have an incredibly just right uncwnny feeling I found out exactly what I needed. webb site and give it a glance on a continuing basis. Thanks for all of the work on this web page. My daughter really likes participating in research and it’s really simple to grasp why. Almost all learn all of the lively tactic you render valuable ideas via the web site and boost contribution from visitors on this theme so my princess is actually studying a lot. Take advantage of the rest of the new year. You’re the one performing a first class job. I beliieve everything typed was actually very logical. to possibly get a person’s attention? I mean THIS IS WHAT YOU WILL FIND IN SPAIN IN AUGUST END – TravelJingyles is a little vanilla. You ought too look at Yahoo’s home page andd see how tey create news titles to gfab peple to open the links. I was abl to find good advice from your blog articles. You could definitely see your enthusiasm in the paintings you write. The sector hopes for more passionate writers like you who are not afraid to say how they believe. Always go after your heart. I visited various web sites but the audio feature for audio songs present at this web page is in fact excellent. Hello, Neat post. There’s an issue along with your website in internet explorer, may test this? IE nonetheless is the marketplace leader and a good component of people will pass over your fantastic writing due to this problem. Hello there! This article could not be written any better! Going through this article reminds me of my previous roommate! He always kept talking about this. I most certainly will send this information to him. Pretty sure he will have a great read. Thanks for sharing!